As promised in last week’s post, we’ve got some great ideas for New Year’s Eve this week: a family New Year’s Eve in Niagara Falls, elegant dining north of Toronto and in our nation’s capital and an Algonquin Park wilderness adventure complete with a log cabin lodge stay. The Americana Conference Resort & Spa in Niagara Falls has “Family Spectacular” – non-stop New Year’s Eve fun for the whole family. It’s a big hit every year with an all-you-can-eat buffet and lots of entertainment like The Smudge Fundaes and the Zero Gravity Circus. More info here. The Americana also has one- and two-night packages with the new Rink at the Brink. 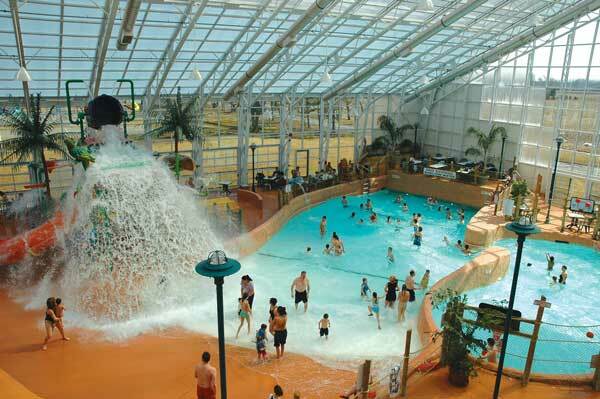 The one-night package includes tickets to the Rink at the Brink which is right by the falls, passes to Americana’s Waves Indoor Waterpark as well as your accommodation. Two night packages are the same except they’ve added a $50 meal voucher for the in-house restaurant and Waves snack bar. Check out Tourism Niagara for more news on Rink at the Brink and other things to do in the Niagara region. In the Caledon Hills, 45 minutes northwest of Toronto, the Millcroft Inn and Spa will ring in the new year with its “New Year’s Eve Gala Getaway”. 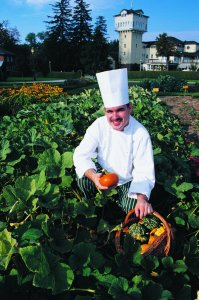 You get two nights at the inn, a welcome reception on December 30th and then a three-course dinner from their a la carte menu. On December 31st there’s a Country Continental Breakfast Buffet, an Al fresco Lunch (on the Pinnacle or wedding garden, weather permitting). The New Year’s Eve Gala Dinner has live entertainment with the Brenda Lewis Jazz Band, festive party favours and a champagne toast at midnight. January 1st starts with a light breakfast buffet. But if you sleep in, you can catch the New Year’s Day Brunch a little later. Gratuities on food and beverages are included. This package starts at $299 CAD per person, per night (plus taxes, based on double occupancy and a two night stay, subject to availability). Valid December 30-31, 2009. To get in touch with the Millcroft, call them at 1-800-383-3976 or check them out on the web. Also see the post we did on them last August and some comments about their food from last week. The elegant Brookstreet Hotel might be the way to go in Ottawa. It has a seven course New Year’s Eve dinner planned. The food at Brookstreet is exceptional (CAA four-diamond rating for both hotel and restaurant) and the place has a real contemporary feel. You can get late night seating times for dinner priced at $149.95 per person and, if you decide t0 make a night of it, they’ll throw in a room for $99/double occupancy. Taxes and gratuities are extra. Personally, I have my eye on the 850 square foot Master Suite with Jacuzzi and balcony, but I haven’t called for a price on that yet. There are a lot of package options at this time of year, so check out the website for details and pricing. 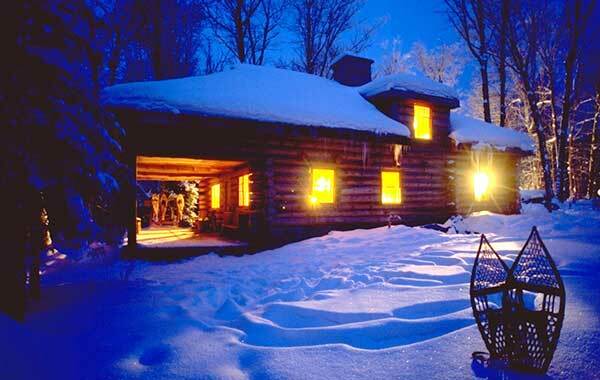 This next New Year’s Eve idea combines a log cabin stay in the Canadian wilderness with traditional Canadian winter activities. The place is Algonquin Log Cabin near Algonquin Park. Nothing beats a jump in the snow fresh out of this lodge’s wood-fired sauna! But hey, that’s just my opinion. If you want black dresses and high-heels on New Year’s Eve, you may prefer the Brookstreet or the Millcroft. 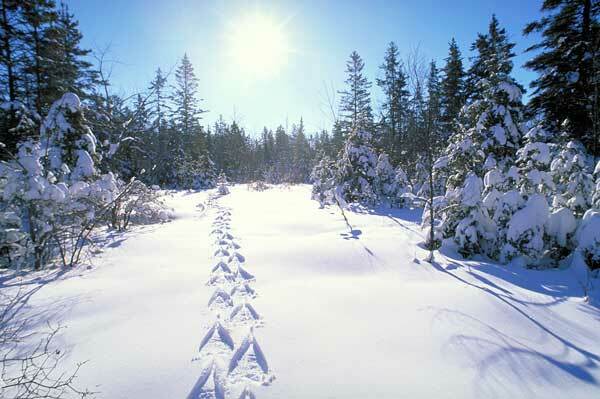 “Snowshoeing, Torch Lit Skating and Backcountry Skiing” are planned from December 31, 2009 to January 2, 2010 at Algonquin Log Cabin. This spectacular split log lodge with its huge fieldstone fireplace is on a lake bordering Algonquin. In winter, the park is a land of frozen lakes, waist-deep snow, and lots of crisp clear air. Accommodation at the lodge is double occupancy with shared indoor washrooms, as well as a sauna and shower cabin. Group size is limited to 12 guests and two guides who prepare all the meals. After an invigorating day on the trail, it’s the perfect place to hang out. This New Year’s Eve getaway is priced at $475 per person. Add-on activities include ice fishing and dogsledding. Return transportation from Toronto is available for $175 per person. See the website for further details. This fine old stone house, now The Waring House Inn, has stood sentinel at Waring's Corners since about 1860. We sat in Amelia’s Garden dining room at a window table in front of a bed of blooming Iris watching yellow finches and doves in the garden outside. 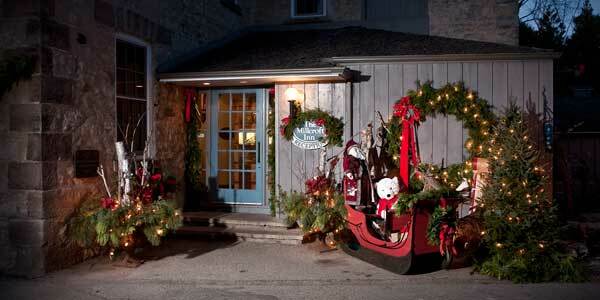 Ginny Merritt, the marketing manager at the Waring House Inn & Cookery, had invited us here. We were to experience Chef Luis de Sousa’s new five-course tasting menu dinner and guided wine tasting, and to stay overnight in one of the Waring House Inn’s new suites. The tasting menu is basically a chef’s way of showing off his best stuff. I was a little intimidated by the ten pieces of silver utensils at each place setting! They were a harbinger of the extravaganza to come. Jeremy was our server and there was nothing he didn’t know about the local wines. He called them the “gems of the County”. It’s all about “The County” out here, Prince Edward County that is, the rapidly expanding tourist destination that some call the new Niagara. Small wineries have been popping up here lately like mushrooms after a rain. Talk about local! The wines being served here are all from wineries close by, with names like Rosehall Run, Huff Estates and Black Prince (Judy loved the Black Prince 2007 Cabernet Franc so much we are thinking of dropping by the winery to pick up a couple of bottles). By the time we made it through the squash, the pear, the blue and the brie, we had licked our lamb chops and mused about the venison medallions, enjoyed the glaze, the drizzle, the jus, the bisque and the tapenade, it was time for dessert. I was just barely able to make room for the rhubarb and berry pie (all local and seasonal of course) topped with a scoop of vanilla from Slickers, the local, artisan ice cream maker. After three hours at the table, we said “good night” to Jeremy and made our way out through The Barley Room Pub, the Picton meeting place where the locals were just starting to get going. Our home away from home was in one of the spectacular new lodges that have just opened at The Waring House. Named Commercial Project of the Year by the Prince Edward County Construction Company, the two lodges each hold sixteen rooms and suites. We were given one of the suites and couldn’t believe its size when we walked through the front door. It had a full living room, huge ensuite bath, a two poster king bed and two gas fireplaces. I don’t normally sleep well in a strange bed but that night I slept like a log, so the first thing I did when I woke up was check the name of the mattress. BeautyRest World Class with an extra four inch mattress on top of it. Absolutely divine. Gibbard’s Furniture, which has made furniture in nearby Napanee for 170 years, handcrafted all of the fine cabinetry in our suite. I fell in love with the little vanity and bedside tables only to be told that Gibbard’s is going out of business. I guess it just can’t compete with all the cheap imports. That’s a real loss for Canada because the company’s workmanship is outstanding!